August 9, 2011 - Cebu Pacific of the Philippines has finalized a firm order with Airbus for the purchase of 30 A321neo aircraft. The contract firms up a previously announced MOU signed in June. With this latest purchase agreement the fast-growing carrier has increased its total firm orders for the A320 Family to 71, of which 16 have already been delivered. The airline currently operates 25 A320 Family aircraft, including the 16 purchased from Airbus and nine leased aircraft. The A321neo is the largest model in the recently launched A320neo series, which incorporates new engines and large wing tip devices called sharklets. The advances will deliver fuel savings of over 15 percent and additional payload or range capability. The fuel savings translate into some 3,600 tons less CO2 per aircraft per year. In addition, the aircraft will provide a double-digit reduction in NOx emissions and reduced engine noise. The A320 Family (A318, A319, A320 and A321) is recognized as the benchmark single-aisle aircraft family. Close to 7,700 A320 Family aircraft have already been ordered and more than 4,700 delivered to more than 330 customers and operators worldwide. The A320neo series will have over 95 percent airframe commonality with the existing models, enabling it to fit seamlessly into existing A320 Family fleets. The new engines types offered on the A320neo Family are CFM International?s LEAP-X and Pratt & Whitney?s PurePower PW1100G. 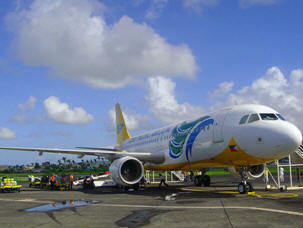 Cebu Air, Inc., operating as Cebu Pacific Air, is based on the grounds of Ninoy Aquino International Airport (Manila Terminal 3), Pasay City, Metro Manila, the Philippines. It offers scheduled flights to both domestic and international destinations. Cebu Pacific Air is currently the country's leading domestic carrier, serving the most domestic destinations with the largest number flights and routes, and equipped with the youngest fleet. Its main base is Ninoy Aquino International Airport, Manila, with other hubs at Mactan-Cebu International Airport, Zamboanga International Airport, Francisco Bangoy International Airport and Diosdado Macapagal International Airport.